The price tag isn't the only thing - or the most important thing - on your shoppers' minds. The Takeaway: Consumers aren't just searching for the best price online, don't underestimate the impact of the customer experience in winning sales. Good product content and convience can drives sales despite the cost of items. Price matters. But not as much as you might think. 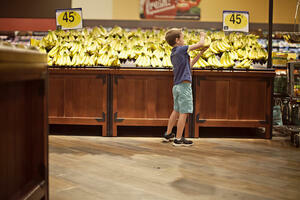 Yes, consumers are conducting "price comparison shopping." They're picking up their smartphones while in stores, and they're completing Google searches, checking out retailers' apps and visiting brands' sites. Think With Google found that 82 percent of shoppers use their phones to find supplemental information - prices, but also product content such as detailed ingredients lists and customer reviews. 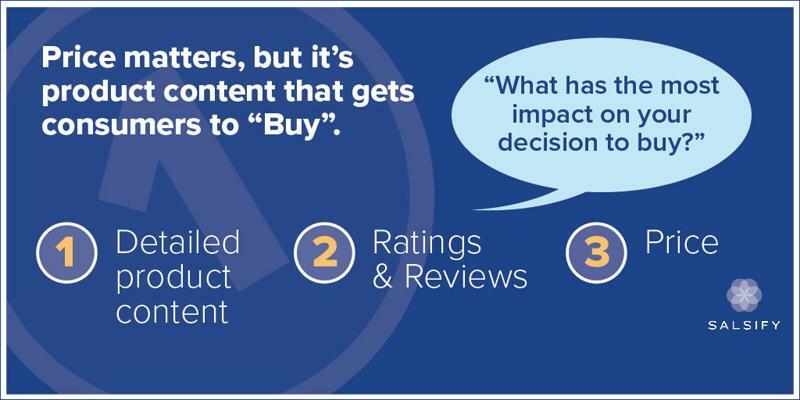 In fact, product content is more influential than price when shoppers are faced with making a purchase decision. Our consumer research, "Cracking the Consumer Code: Product Content Drives Conversion," found this major subversion of the very popular trending observation that price matters the most. In reality, the cost of your items is the third most impactful factor that drives conversions, behind detailed product content - which is No. 1 - and ratings and reviews - which places second. Check out full consumer research report here. Price comparison shopping helps consumers identify which item to buy and where to get it, but price isn't the end-all, be-all of shopping. 58 percent of U.S. grocery shoppers would rather have "better-quality produce" than cheaper products. 56 percent said convenience is "more significant" than price tags. How can your brand convey the quality of your products? More rich and detailed product content. You must engage shoppers with storytelling and inform them with the specifics like how your products are made and their many use cases. And how can your brand make shopping experiences more convenient? Ensure that your product content is on each and every channel - put it where your customers are. (That's called distributed commerce and you can learn more about this trend in this blog post.) Because if shoppers can't find your product and information when they perform a Google search on their smartphones while in-store, then they'll buy something else - the price has no impact. Not too long ago, we discovered that around one-third of consumers buy products from unexpected sources after finding product content that better informs their purchases. More recently, Think With Google reported that 51 percent of shoppers have bought an item from a different company or brand than originally intended due to the quality of product information that they found while searching. The times are a'changing, and product content is becoming more important every day. Writing for Mobile Commerce Daily, Alex Samuely summed it up perfectly when writing on the subject of price comparison shopping: "The key is serving up experiences and content so rich and information-heavy that they prevent consumers from taking their business elsewhere." At the end of the day, if you engage shoppers with rich product content and make them feel like they're making an informed purchase decision based on a wealth of information that you provide, price won't matter.